Sometimes I think you just need to go back and revisit some good times in your life. In my creative life, it brings me back to when I first saw a Whiff of Joy stamp that Elisabeth Bell had designed and I fell into instant love! 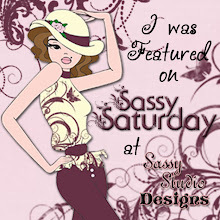 There was such a sweetness and purity about her designs and I knew they were for me! 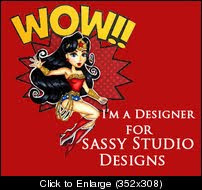 One of the happiest times for me was when I was first started on a couple of design teams and Susana's Custom Art and Card Designs was one of my first design teams and I absolutely loved it! In got to work with some wonderfully creative people, some of the best in our field, Suzanne Dean, Danni Bindel and lots of others. When I heard we were going to be doing of of Elisabeth's brand new lines, I was so ecstatic that I jumped up and down and yelled and hollered! Crazy, it may have been, but I just couldn't believe my good luck. 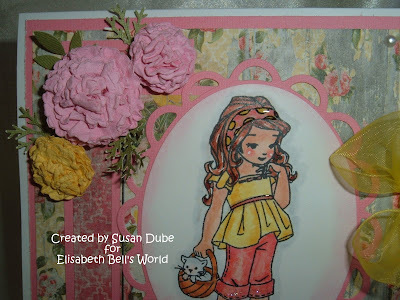 For our challenge over at Elisabeth Bell's World Challenge Blog, Lynda has challenged us with a theme of "April Showers Brings May Flowers", and asked us to use lots of flowers and springtime colors. 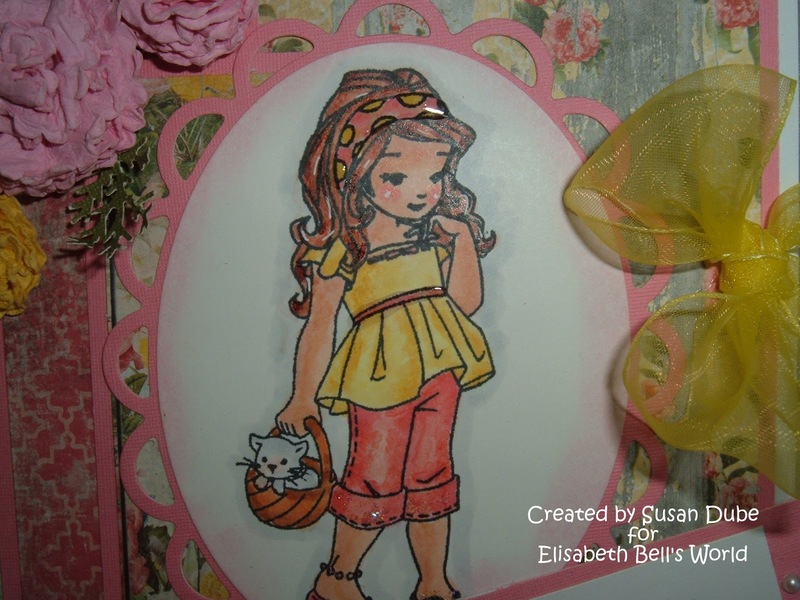 I pulled out my sweet "Emma", who is one of the gorgeous images from that first release with Susana's Custom Art and Card Designs. 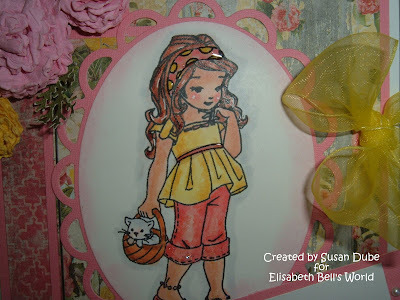 You can see all of Elisabeth's available stamps at Susana's shop here. She's still one of my all time favorite images of all time! I love her innocence and sweetness. She's colored with copics and has some stickles on her pants and top, and some Diamond Glaze on her headband and ribbon on her top She's cut out and framed with Nestabilities and the gorgeous papers are from My Mind's Eye. The ribbon and pearls are from my stash and the flowers are handmade and I added some Martha Stewart branches to her. Link Up For Pink - Breast Cancer Awareness, inspirational, healthy reminders, "celebrate more birthdays", you're in my thoughts, encouragement, etc. Stop over at our Elisabeth Bell's World Challenge Blog and see the beautiful creations my sisters have come up with for your viewing enjoyment. Inspiration and flowers and spring colors are popping up all over the place over there! Hope everyone has a fabulous, springy day! Love the pink and yellow combo! Gorgeous card, Susan! I love the colors, papers and sweet image! Wonderful coloring! You made my head swell with such kind words!! Love your sweet card! Hugs! Your card is just beautiful!! I love the image and the design. A really awesome creation. 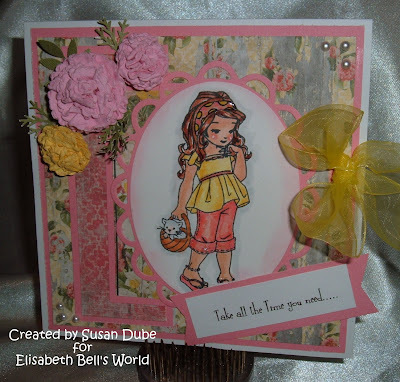 Thanks for joining us at Link Up for Pink and hope to see more of your gorgeous cards posted. Love your colouring! Love the flowers~ Thanks for joining us this week at Creative Card Crew! Susan, love your sweet card. I was nice working on the Sassy Team with you. I am very glad you entered this week at LUFP. I hope you had fun!!! See you back very soon to play in another fun challenge. Remember to get the girls checked and remind a friend! :-) Together we can beat Breast Cancer!!! Beautiful card!! Such a sweet image and you colored it so well!!! 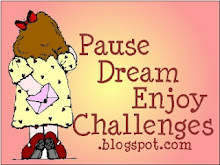 Thanks for joining LUFP challenge #12!! Such a pretty card and soft indeed! So glad you joined us at 365 Cards! How very sweet and pretty! Thanks so much for playing along with us at the Color Throwdown this week! What a beautiful image and your coloring looks sooo pretty!!! Thanks for joining us for the Color Throwdown Challenge!!! How precious! Love those flowers :) Thank you for playing along with us over at 365 Cards!! Just gorgeous - love your image and all the details you've added. Love your card! The flowers are lovely. 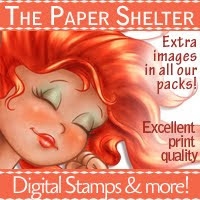 That stamp image is a cutie! Thanks for playing along at Link Up For Pink.